Researchers at Washington University in St. Louis have discovered and characterized a new form of oxygen dubbed "featherweight oxygen"—the lightest-ever version of the familiar chemical element oxygen, with only three neutrons to its eight protons. Oxygen is one of the most abundant elements in the solar system, but oxygen-11 can be produced only in a laboratory. It decays immediately after its creation by emitting two protons, and it can be observed solely through detection of its decay products. Two-proton decay is the most recently discovered nuclear decay channel. "What is most interesting to the nuclear physics community, however, is that oxygen-11 is the nuclear mirror of lithium-11, a very well-studied heavy isotope of lithium," said Tyler Webb, a Ph.D. candidate in physics in Arts & Sciences at Washington University, who works with Robert J. Charity, research professor of chemistry in Arts & Sciences, and Lee G. Sobotka, professor of chemistry and of physics. Webb is the first author of a new paper on the discovery in Physical Review Letters. 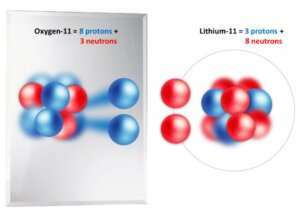 In nuclear physics, nuclei are said to be mirrors when one has a certain number of neutrons and protons and the other has a reversed amount, such as the 3:8 ratio of neutrons to protons in oxygen-11 as compared to the 8:3 ratio in lithium-11. 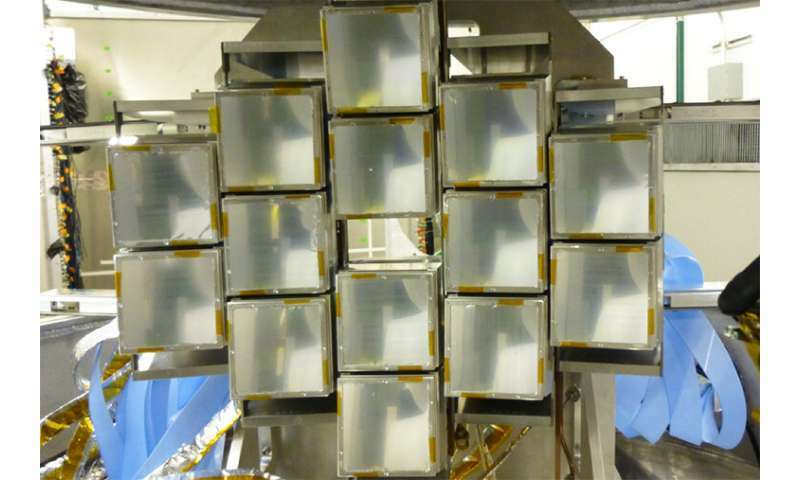 "When talking about mirror nuclei, we expect a sort of symmetry to hold," Webb said. "The properties of a nucleus and its mirror should be similar: Quantum states should be roughly close in energy relative to the nucleus's ground state and the wave functions of those states should be similar." This symmetry can be stretched or broken, however. Scientists can compare the actual structure of mirror nuclei against their expected structure to learn more about this important symmetry of atomic nuclei, the stuff that composes the visible matter of the universe. In this case, the researchers are most excited to compare lithium-11, which they know has two very loosely bound neutrons in a "halo" orbiting its core, to oxygen-11, which has two unbound protons. The Washington University researchers pieced together evidence of oxygen-11 in an experiment conducted at the National Superconducting Cyclotron Laboratory on the campus of Michigan State University. The Physical Review Letters paper outlines both the experiment and the supporting calculations conducted by theoretical nuclear physicists Witold "Witek" Nazarewicz and Simin Wang of Michigan State University. Researchers from University of Connecticut and Western Michigan University also participated in the collaboration. "Hydrino gas was observed to have a faster migration time and a higher thermal conductivity than any known gas as shown by a negative gas chromatographic peak before hydrogen in a helium carrier gas [link]. This data adds to the massive portfolio of other analytical tests that confirm the existence of hydrino [link], a smaller more stable form of hydrogen formed by the release of massive power." @Ghost: Lemme know when someone gets rich with that. "Lemme know when someone gets rich with that." Just as soon as he let's us know how his friend Rossi is doing with his cold fusion reactor that was supposed to be - what was it? - absolutely definitely out and revolutionizing everything like 5 years ago? Nah rossi has finally proven himself a fraud. IMO of course. His last presentation was one of the most pathetic things I've ever seen. And of course rossi being a loser doesnt mean dr Mills is one as well. The jury is still out on BLP. They continue to present high-quality, experiment-based evidence that is hard to refute. For those who actually try that is, instead of just sticking their pointy little noses skyward. -I suppose you could fake a vid of a ss ball repeatedly heating red hot in a few seconds, or a ss box breaching in a flood of white-hot sparks in a few seconds. They do have many millions of seed money to spend after all. I dunno about rich but I think hes doing pretty well. Then he should get rich to prove a point. Not. A scam he's been pulling for decades, with a production model just around the corner for said decades. They continue to present high-quality, experiment-based evidence that is hard to refute. When did that happen? Lol. the single most studied element in existence has only one person driving the claim that he's reached a point lower than the known, existing, repeatedly demonstrated and validated ground state? Yes I know Ive heard it all before. Funnily enoughily, your google link lists a number of mills papers. Whatever would statistics have to do with it?? So apparently youve been to the BLP website and viewed all the vids, and also read his latest papers? Just for fun tho stumpy, why dont you offer a conjecture on how they could burn through a ss sphere so quickly in the 091918 vid? Funnily enoughily, your google link lists a number of mills papers. What power constraints do I have? Just for fun, why don't you look at the real science, and see where anybody has even replicated his idiocy? Why don't you realise that dumb videos are not the way science is done? Why don't you realise that those videos are just nonsense designed to trick the gullible out of their money? Why don't you realise that the ground state of H is called that for a reason? Mills is a con artist. He has made claims of detections that the instrument he was using was incapable of detecting. He is not even qualified in the subject. Fine, if you want to believe crap like this.... go put your mortgage on it. Wave goodbye to your money. He is a crook. Be warned. Oh come on. New things about old stuff is being discovered every day. "Not found yet and so never will be found" is hardly a valid argument no matter who it comes from. "Charles H. Duell was the Commissioner of US patent office in 1899. Mr. Deull's most famous attributed utterance is that "everything that can be invented has been invented."" Oh thank you ever so much Pater Stumpy for your wisdom may I have some pudding now? and again: thinckness? solid? what type SS? are there other materials involved? may I have some pudding now? how can you eat your pudding if you don't eat your meat? so, mills used an old tank manufactured during an age where consistency between batches of material wasn't always considered due to the nature of the rush to produce? but seriously: what, exactly, can be validated from mills videos? how do you know it's not set up to look like [x] while actually being [y]? What could be validated from wright bros flights? Stumpy would be reading about it in the papers (old news venue) and be asking 'Those photos are irrelevant... is that a blimp with a guide wire? Tell you what - just watch a few more sofilein vids and youll forget all about validation. BTW zeph never had a cool lab full of ss equipt, oscilloscopes, and hydrino haze. And millions in seed money. And a little black mercedes in the parking lot. maybe the instant internet research ability will cure fake news? -But I didnt say that at all. "The "Great Moon Hoax" refers to a series of six articles that were published in The Sun, a New York newspaper, beginning on August 25, 1835"
-Reminds me of the collusion hoax. I can only requote what you posted: -UNbelievable. If you could f*** around with the hydrogen atom, you could f*** around with the energy process in the sun. You could f*** around with life itself. Everything we know about everything would be a bunch of nonsense. That's why I'm so sure that it's a fraud. I wonder why he stopped pushing his cancer cure? Surely he should be a billionaire now with that alone, eh? No its drawing conclusions while claiming to be merely skeptical in your earlier comments. Which is it? "the cosmological constant problem or vacuum catastrophe is the disagreement between the observed values of vacuum energy density (the small value of the cosmological constant) and theoretical large value of zero-point energy suggested by quantum field theory." -Lots of problems left to solve which unfortunately (for you guys) or fortunately (for eager young scientists and mills, whatever he is) leaves lots of room for unexpected new theories. "Arthur C. Clarke Quotes. If an elderly but distinguished scientist says that something is possible, he is almost certainly right; but if he says that it is impossible, he is very probably wrong." Well you dont need mills to do that. And what has that got to do with Hydrogen (not) having states below the ground state? Silly post. Who cares? It is only a sop to the idiots that have invested in it. He'll still be doing this in 10 years if he lives that long. Just as he was doing 20 years ago. It's a scam. "Um, he's been showing it - the SunCell type of reaction - to the world for the last five years. During that time the advancements have been very apparent. No he has not. He shows youtube videos that are easily faked and he fails to provide the convincing evidence that he claims to have. BTW how are "the advancements have been very apparent" when in 2016 he was claiming to be delivering prototypes ready for commercialization to a third party and now that has fallen through and he has no projections on when he's going to actually do that?